Labour face being wiped out in Scotland after the next general election, as a new poll continues to give the Scottish National Party (SNP) a significant lead. The poll projects Labour would lose 36 out of 40 seats in Scotland, the Lib Dems would be wiped out, and the Tories would lose their solitary seat, while the SNP would gain a massive majority. The SNP command a 52.5 percent majority according to the poll by Ipsos MORI, with Labour lagging behind at 24.2 percent. Wednesday’s poll, commissioned by Scottish Television, shows a drop in support for all parties except the SNP. The results will deal a blow to Scottish Labour leader Jim Murphy, who appears to be failing to win over voters in the post-independence political landscape. 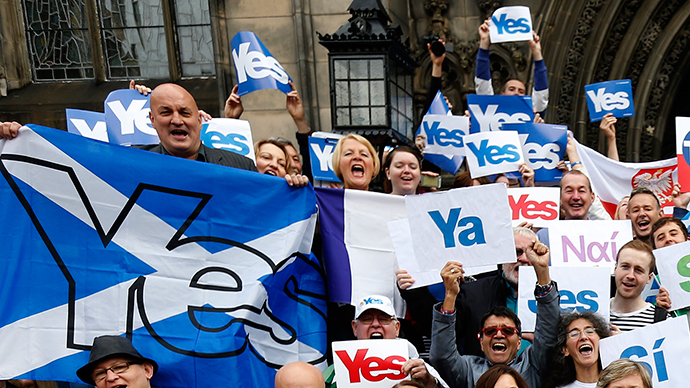 The SNP has seen a surge in popularity following Scotland’s independence referendum last September, which saw the pro-Union vote claim victory. With 92,000 members as of November last year, the SNP have the third largest membership base in the UK after Labour and the Conservatives, according to an openDemocracy report. This latest survey follows a Survation poll published on Sunday, which suggested SNP support was at 46 percent, while Labour’s was 26 percent. “The SNP aren't going to be the next government, it's a two-horse race between Labour and Tories and unfortunately SNP supporters might, by accident, help David Cameron cling on to power,” he added. This week’s opinion surveys follow Murphy’s announcement to target 200,000 ex-Labour supporters, who have switched allegiance to SNP since the independence referendum last year. With both polls forecasting major Labour losses, many will wonder if Murphy has an impossible task on his hands. Traditionally a Labour heartland, Scotland was a key source of support for the party in the last general election, fielding it with 40 Westminster MPs. One ex-Labour supporter turned SNP supporter explained his reasons for switching allegiance. Going by the Twitter handle “MrMulky,” the 48 year old said he supported Labour up until 2003, when the Labour government took Britain to war against Iraq. “But it wasn’t until the 2005 election that I could actually vote against them. Their majority dropped by 100 seats in that election,” he said. “Essentially, they have taken the place of Labour in Scotland, because Labour have moved to the right,” he added. To fully understand the extent of Scotland’s shift towards the SNP in recent months, it was worth looking at opinion polls from the run up to the last general election in May 2010. A YouGov poll conducted on 7 January 2010 indicated SNP had 25 percent support, while Labour led with 36 percent and the Tories were in third place with 17 percent. Labour ended up with 42 percent of the vote in the 2010 election, over twice that of the SNP. Jim Murphy has a little over three months to replicate this success in the next election. To do so would not just “confound and defeat” the polls, it would also save his party in Westminster.